A feisty blonde beard booster, this subtle pigment blend warms blondes to a golden-ginger blush, while adding all the nourishing benefits of a traditional henna-herbal treatment. The expressed color is a smooth, gingery, strawberry blonde. Vibrant warm color-booster to all blondes. Subtle warmth to light brunettes. • mixes well with our other henna colors too. A feisty blonde beard booster, this subtle pigment blend warms blondes to a golden-ginger blush, while adding all the nourishing benefits of a traditional henna-herbal treatment. The expressed color is a smooth, gingery, strawberry blonde. Vibrant warm color-booster to all blondes. Subtle warmth to light brunettes. *mixes well with our other henna colors too. NOTE: This color will not show on darker beard colors. It will not lighten dark whiskers (zero harsh bleaching agents). Blonde to very light brown beards will achieve best results. From hard water to daily pollution to aftershave, a blonde beard needs a boost to get back its luster and unique hue. This safe transition warms up cool blondes (blue/green undertones) a couple notches to a golden-ginger blush, while nourishing your facial skin as it sets the color—it’s great stuff. The expressed color is a smooth, gingery, strawberry blonde. Subtle warmth to light brunettes. Vibrant warm color-booster to all blondes. I am totally happy with this product, the effect is subtle, I have very light platinum hair and a blond and reddish beard which has many many white hairs appearing as I get older. 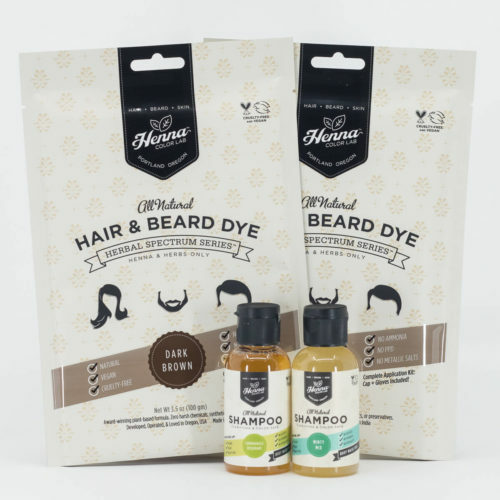 The henna is easy and fun to apply and leaves a subtle and warm finish – evening the tones in my beard and adding color to my hair without a nasty artificial shock. An excellent natural product I highly recommend! I want to like this product, .i like that it contains no chemicals, isn’t tested on animals etc. But or me, it did absolutely sod all. I wasn’t expecting great transformative things. I’m 40, my ginger scruff has a few white patches. It doesn’t bother me that much, but I thought I might try colouring, to see what it would look like. I followed all directions, let it sit for 90 minutes. Rinsed it out. No change. White patches remained. I tried it again the following night. Again, no change. Sorry – maybe others will have better luck, but this product did absolutely nothing for me. Pretty great. I used it yesterday for the first time on my dark/dirty blonde hair w/ platinum highlights and the result was a golden blonde with a gingery tint. I love it, but I wish it was more ginger looking. I have always been a strawberry blonde for both my hair and my goatee. However, as I am now 50, my goatee has gown entirely gray below the chin and it is climbing towards my mustache fast! The ginger-blonde mixture is perfect for my hair color and a perfect way to take years off my look. It is so subtle nobody appears to have noticed and, when I wanted more color, I simply applied it again a day or 2 later. I have reached my desired original hair color and have used this product 4x now. I have sensitive skin and am unable to use competitive products. Also, I have not found a similar color anywhere else. This is perfect! Another great thing is that I only use a single table spoon of product each time so I expect this purchase to last me several months. I have taken pictures but I do not see a way to show before and after photos but I would if I could. This stuff is magic.